Human heart tissue does not heal well after a heart attack, instead forming debilitating scars. For reasons not completely understood, however, stem cells can assist in this repair process by turning into the cells that make up healthy heart tissue, including heart muscle and blood vessels. Recently, doctors elsewhere have reported promising early results in the use of cardiac stem cells to curb the formation of unhealthy scar tissue after a heart attack. But the discovery of a "master molecule" that guides the destiny of these stem cells could result in even more effective treatments for heart patients, the Johns Hopkins researchers say. "In biology, finding a central regulator like this is like finding a pot of gold," said Andre Levchenko, a biomedical engineering professor and member of the Johns Hopkins Institute for Cell Engineering, who supervised the research effort. "Our findings greatly enhance our understanding of stem cell biology and suggest innovative new ways to control the behaviour of cardiac stem cells before and after they are transplanted into a patient. This discovery could significantly change the way stem cell therapy is administered in heart patients." Earlier this year, a medical team at Cedars-Sinai Medical Center in Los Angeles reported initial success in reducing scar tissue in heart attack patients after harvesting some of the patient's own cardiac stem cells, growing more of these cells in a lab and transfusing them back into the patient. Using the stem cells from the patient's own heart prevented the rejection problems that often occur when tissue is transplanted from another person. Levchenko's team wanted to figure out what, at the molecular level, causes the stem cells to change into helpful heart tissue. If they could solve this mystery, the researchers hoped the cardiac stem cell technique used by the Los Angeles doctors could be altered to yield even better results. During their research, the Johns Hopkins team members wondered whether changing the surface where the harvested stem cells grew would affect the cells' development. The researchers were surprised to find that growing the cells on a surface whose rigidity resembled that of heart tissue caused the stem cells to grow faster and to form blood vessels. 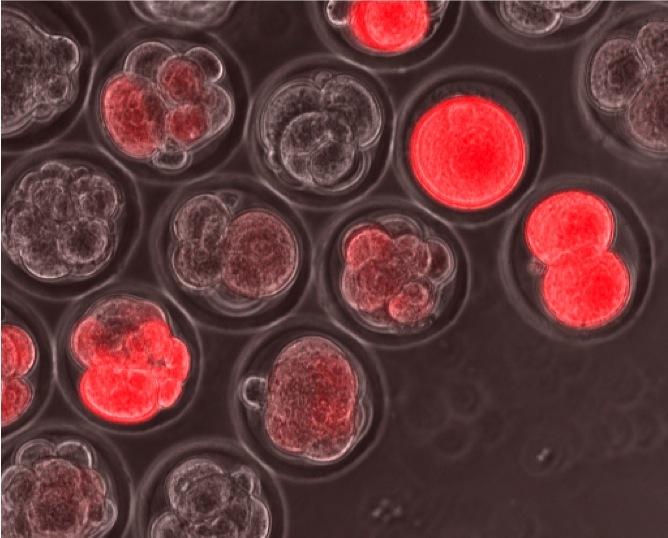 A cell population boom occurred far less often in the stem cells grown in the glass or plastic dishes typically used in biology labs. This result also suggested why formation of cardiac scar tissue, a structure with very different rigidity, can inhibit stem cells naturally residing there from regenerating the heart. "It was the kind of master regulator of this process," Levchenko said. "And an even bigger surprise was that if we directly forced this molecule to disappear, we no longer needed the special heart-matched surfaces. When the master regulator was missing, the stem cells started to form blood vessels, even on glass." "The stem cells started to turn into cardiac muscle tissue, instead of blood vessels," Levchenko said. "This told us that this amazing molecule was the master regulator not only of the blood vessel development, but that it also determined whether cardiac muscles and blood vessels would develop from the same cells, even though these types of tissue are quite different." But would these lab discoveries make a difference in the treatment of living beings? To find out, the researchers, working on the heart-matching surfaces they had designed, limited the production of p190RhoGAP within the heart cells. The cells that possessed less of this protein integrated more smoothly into an animal's blood vessel networks in the aftermath of a heart attack. In addition, more of these transplanted heart cells survived, compared to what had occurred in earlier cell-growing procedures. Kshitiz said that the special heart-like surface on which the cardiac stem cells were grown triggers regulation of the master molecule, which then steers the next steps. "This single protein can control the cells' shape, how fast they divide, how they become blood vessel cells and how they start to form a blood vessel network," he said. "How it performed all of these myriad tasks that require hundreds of other proteins to act in a complex interplay was an interesting mystery to address, and one that rarely occurs in biology. It was like a molecular symphony being played in time, with each beat placed right at the moment before another melody has to start." As the disease is unique to humans, previous methods to employ this approach had been unreliable in predicting how it occurs in humans. In the research published in PLoS ONE, to the team reproduced this model with skin cells from multiple patients, taking them back in time to a pluripotent stem cell state (iPS cells), and then driving them forward to study the diseased patient-specific motor neurons. Children born with this disorder have a genetic mutation that doesn't allow their motor neurons to manufacture a critical protein necessary for them to survive. The study found these cells die through apoptosis – the same form of cell death that occurs when the body eliminates old, unnecessary as well as unhealthy cells. As motor neuron cell death progresses, children with the disease experience increasing paralysis and eventually death. There is no effective treatment now for this disease. An estimated one in 35 to one in 60 people are carriers and about in 100,000 new-borns have the condition. "Now we are taking these motor neurons (from multiple children with the disease and in their pluripotent state) and screening compounds that can rescue these cells and create the protein necessary for them to survive," said Dhruv Sareen, director of Cedars-Sinai's Induced Pluripotent Stem Cell Core Facility and a primary author on the study. "This study is an important stepping stone to guide us toward the right kinds of compounds that we hope will be effective in the model – and then be reproduced in clinical trials." With their potential to treat a wide range of diseases and uncover fundamental processes that lead to those diseases, embryonic stem (ES) cells hold great promise for biomedical science. A number of hurdles, both scientific and non-scientific, however, have precluded scientists from reaching the holy grail of using these special cells to treat heart disease, diabetes, Alzheimer's and other diseases. tissue. Here, red fluorescent "reporter"
In a paper published June 13 in Nature, scientists at the Salk Institute for Biological Studies report discovering that ES cells cycle in and out of a "magical state" in the early stages of embryo development, during which a battery of genes essential for cell potency (the ability of a generic cell to differentiate, or develop, into a cell with specialized functions) is activated. This unique condition, called totipotency, gives ES cells their unique ability to turn into any cell type in the body, thus making them attractive therapeutic targets. "These findings give new insight into the network of genes important to the developmental potential of cells” says senior author Samuel L. Pfaff, a professor in Salk's Gene Expression Laboratory,. “We've identified a mechanism that resets embryonic stem cells to a more youthful state, where they are more plastic and therefore potentially more useful in therapeutics against disease, injury and aging." ES cells are like silly putty that can be induced, under the right circumstances, to become specialized cells-for example, skin cells or pancreatic cells-in the body. In the initial stages of development, when an embryo contains as few as five to eight cells, the stem cells are totipotent and can develop into any cell type. After three to five days, the embryo develops into a ball of cells called a blastocyst. At this stage, the stem cells are pluripotent, meaning they can develop into almost any cell type. In order for cells to differentiate, specific genes within the cells must be turned on. Pfaff and his colleagues performed RNA sequencing (a new technology derived from genome-sequencing to monitor what genes are active) on immature mouse egg cells, called oocytes, and two-cell-stage embryos to identify genes that are turned on just prior to and immediately following fertilization. Pfaff's team discovered a sequence of genes tied to this privileged state of totipotency and noticed that the genes were activated by retroviruses adjacent to the stem cells. Nearly 8 percent of the human genome is made up of ancient relics of viral infections that occurred in our ancestors, which have been passed from generation to generation but are unable to produce infections. Pfaff and his collaborators found that cells have used some of these viruses as a tool to regulate the on-off switches for their own genes. "Evolution has said, 'We'll make lemonade out of lemons, and use these viruses to our advantage,'" Pfaff says. Using the remains of ancient viruses to turn on hundreds of genes at a specific moment of time in early embryo development gives cells the ability to turn into any type of tissue in the body. From their observations, the Salk scientists say these viruses are very tightly controlled-they don't know why-and active only during a short window during embryonic development. The researchers identified ES cells in early embryogenesis and then further developed the embryos and cultured them in a laboratory dish. They found that a rare group of special ES cells activated the viral genes, distinguishing them from other ES cells in the dish. By using the retroviruses to their advantage, Pfaff says, these rare cells reverted to a more plastic, youthful state and thus had greater developmental potential. Pfaff's team also discovered that nearly all ES cells cycle in and out of this privileged form, a feature of ES cells that has been underappreciated by the scientific community, says first author Todd S. Macfarlan, a former postdoctoral researcher in Pfaff's lab who recently accepted a faculty position at the Eunice Kennedy Shriver National Institute of Child Health and Human Development. "If this cycle is prevented from happening," he says, "the full range of cell potential seems to be limited." It is too early to tell if this "magical state" is an opportune time to harvest ES cells for therapeutic purposes. But, Pfaff adds, by forcing cells into this privileged status, scientists might be able to identify genes to assist in expanding the types of tissue that can be produced. "There's tremendous hype over the practical applications of embryonic stem cells in clinical situations," he says. "The struggle in labs throughout the world is that the smallest changes in environmental conditions could subtly and unpredictably have an effect on these cells. So, the more we know about the basic requirements needed for these cells to be able to generate a full range of tissue types, the better off we'll be." While the findings shed light on the basic biology of embryonic stem cells, Pfaff says there is still a "long way to go" in terms of their practical, clinical value. et al. Cell Stem Cell Volume 10 Issue 6. Human-derived stem cells can spontaneously form the tissue that develops into the part of the eye that allows us to see, according to a study published by Cell Press in the 5th anniversary issue of the journal Cell Stem Cell. Transplantation of this 3D tissue in the future could help patients with visual impairments see clearly. "This is an important milestone for a new generation of regenerative medicine," says senior study author Yoshiki Sasai of the RIKEN Center for Developmental Biology. "Our approach opens a new avenue to the use of human stem cell-derived complex tissues for therapy, as well as for other medical studies related to pathogenesis and drug discovery." During development, light-sensitive tissue lining the back of the eye, called the retina, forms from a structure known as the optic cup. In the new study, this structure spontaneously emerged from human embryonic stem cells (hESCs) — cells derived from human embryos that are capable of developing into a variety of tissues — thanks to the cell culture methods optimized by Sasai and his team. The hESC-derived cells formed the correct 3D shape and the two layers of the optic cup, including a layer containing a large number of light-responsive cells called photoreceptors. Because retinal degeneration primarily results from damage to these cells, the hESC-derived tissue could be ideal transplantation material. Beyond the clinical implications, the study will likely accelerate the acquisition of knowledge in the field of developmental biology. For instance, the hESC-derived optic cup is much larger than the optic cup that Sasai and collaborators previously derived from mouse embryonic stem cells, suggesting that these cells contain innate species-specific instructions for building this eye structure. "This study opens the door to understanding human-specific aspects of eye development that researchers were not able to investigate before," Sasai says. The anniversary issue containing Sasai's study will be given to each delegate attending the 2012 ISSCR meeting in Yokohama, Japan. To highlight the ISSCR meeting and showcase the strong advances made by Japanese scientists in the stem cell field, the issue will also feature two other papers from Japanese authors, including the research groups of Akira Onishi and Jun Yamashita. In addition, the issue contains a series of reviews and perspectives from worldwide leaders in stem cell research. sequenced, in the Leipzig zoo. 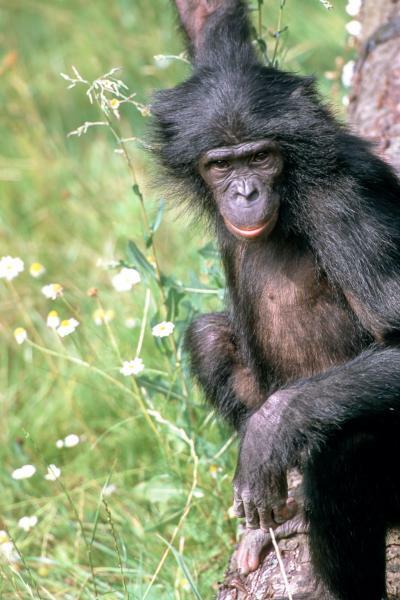 The genome was sequenced from Ulindi, a female bonobo who lives in the Leipzig zoo. Genome sequences have also been generated from all other great apes – chimpanzee, orang-utan and gorilla - making this the final genome of a great ape to be sequenced and providing insights into their relationships with one another and with humans. The comparison of the genome sequences of bonobo, chimpanzee, and human show that humans differ by approximately 1.3% from both bonobo and chimpanzee. Chimpanzees and bonobos are more closely related, differing by only 0.4%. Bonobo and chimpanzee territories in central Africa are close to one another and separated only by the Congo River. It has been hypothesized that the formation of the Congo River separated the ancestors of chimpanzees and bonobos, leading to these distinct apes. Examination of the relationship between bonobos and chimpanzees showed that there appears to have been a clean split and no subsequent interbreeding, which supports this hypothesis. Despite the fact that on average the genomes of bonobos and chimpanzees are equally distant from human, analysis of the genome sequence of the bonobo revealed that for some particular parts of the genome, humans are closer to bonobos than to chimpanzees, while in other regions the human genome is closer to chimpanzees. Further research will determine whether these regions contribute in any way to the behavioural differences and similarities between humans, chimpanzees, and bonobos. Studying mice and humans, researchers at Washington University School of Medicine in St. Louis and their collaborators in Paris have identified two proteins that are required to maintain a supply of stem cells in the developing kidney. steps toward becoming adult nephrons. stage, but without both FGF9 and FGF20. and there is no further kidney growth. In the presence of the two proteins, FGF9 and FGF20, mouse kidney stem cells stayed alive outside the body longer than previously reported. Though the cells were maintained only five days (up from about two), the work is a small step toward the future goal of growing kidney stem cells in the lab. In the developing embryo, these early stem cells give rise to adult cells called nephrons, the blood filtration units of the kidneys. The results appear online June 11 in Developmental Cell. "When we are born, we get a certain allotment of nephrons," says Raphael Kopan, PhD, the Alan A. and Edith L. Wolff Professor of Developmental Biology. "Fortunately, we have a large surplus. We can donate a kidney — give away 50 percent of our nephrons — and still do fine. But, unlike our skin and gut, our kidneys can't build new nephrons." The skin and the gut have small pools of stem cells that continually renew these organs throughout life. Scientists call such pools of stem cells and their support system a niche. During early development, the embryonic kidney has a stem cell niche as well. But at some point before birth or shortly after, all stem cells in the kidney differentiate to form nephrons, leaving no self-renewing pool of stem cells. "In other organs, there are cells that specifically form the niche, supporting the stem cells in a protected environment," Kopan says. "But in the embryonic kidney, it seems the stem cells form their own niche, making it a bit more fragile. And the signals and conditions that lead the cells to form this niche have been elusive." 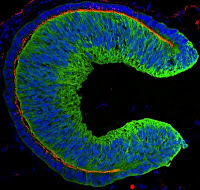 Surprisingly, recent clues to the signals that maintain the embryonic kidney's stem cell niche came from studies of the inner ear. David M. Ornitz, MD, PhD, the Alumni Endowed Professor of Developmental Biology, investigates FGF signalling in mice. Earlier this year, Ornitz and his colleagues published a paper in PLoS Biology showing that FGF20 plays an important role in inner ear development. "Mice without FGF20 are profoundly deaf," Ornitz says. "While they are otherwise viable and healthy, in some cases we noticed that their kidneys looked small." Past work from his own lab and others suggested that FGF9, a close chemical cousin of FGF20, might also participate in kidney development. FGF20 and FGF9 are members of a family of proteins known as fibroblast growth factors. In general, members of this family are known to play important and broad roles in embryonic development, tissue maintenance, and wound healing. Mice lacking FGF9 have defects in development of the male urogenital tract and die after birth due to defects in lung development. 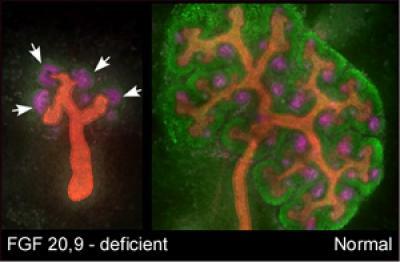 Since FGF9 and 20 are so closely related, Ornitz and Sung-Ho Huh, PhD, a postdoctoral research associate, and former postdoctoral researcher Hila Barak, PhD, thought the two proteins might serve redundant functions in the developing kidney, compensating for each other if one is missing. The next logical question, according to Ornitz, was what happens when both are missing. "When we examined mice lacking both FGF9 and FGF20, we saw that the embryos had no kidneys," Ornitz says. Evidence further supporting the role of FGF signalling in kidney development came from collaborators in France. There, researchers had identified two families that lost more than one pregnancy because the foetuses developed without kidneys, a condition called renal agenesis. Analysing DNA from the foetuses, they found mutations in four genes known to be involved in kidney development. One of these mutations resulted in the total loss of FGF20. This analysis also highlighted an important difference between mice and humans. In mice, FGF9 appears to compensate for a total loss of FGF20. But in the human DNA analysis, the foetuses that developed without kidneys had normal FGF9. "In humans, FGF9 is not enough to rescue the kidney if FGF20 is missing," Kopan says. Now that at least some of the proteins necessary to support the kidney stem cell niche have been identified, Kopan and Ornitz both look to future work to further extend the life of such cells in the lab. "The holy grail would be to deliver these cells back to a diseased kidney," Kopan says. "This is a very small step. But we hope this will be a stimulus to the field, for us and for others to continue thinking about how to convince these cells to stick around longer." Barak H, Huh SH, Chen S, Jeanpierre C, Martinovic J, Parisot M, Bole-Feysot C, Nitschke P, Salomon R, Antignac C, Ornitz DM, Kopan R.
UCLA stem cell scientists purified a subset of stem cells found in fat tissue and made from them bone that was formed faster and was of higher quality than bone grown using traditional methods, a finding that may one day eliminate the need for painful bone grafts that use material taken from the patient during invasive procedures. Adipose, or fat, tissue is thought to be an ideal source of cells called mesenchymal stem cells - capable of developing into bone, cartilage, muscle and other tissues - because they are plentiful and easily attained through procedures such as liposuction, said Dr. Chia Soo, vice chair for research at UCLA Plastic and Reconstructive Surgery. The co-senior authors on the project, Soo and Bruno Péault, are members of the Eli and Edythe Broad Center of Regenerative Medicine and Stem Cell Research at UCLA. Traditionally, cells taken from fat had to be cultured for weeks to isolate the stem cells which could become bone, and their expansion increases risk of infection and genetic instability. A fresh, non-cultured cell composition called stromal vascular fraction (SVF) also is used to grow bone. However, SVF cells taken from adipose tissue are a highly heterogeneous population that includes cells that aren't capable of becoming bone. Péault and Soo's team used a cell sorting machine to isolate and purify human perivascular stem cells (hPSC) from adipose tissue and showed that those cells worked far better than SVF cells in creating bone. They also showed that a growth factor called NELL-1, discovered by Dr. Kang Ting of the UCLA School of Dentistry, enhanced the bone formation in their animal model. "People have shown that culture-derived cells could grow bone, but these are a fresh cell population and we didn't have to go through the culture process, which can take weeks," Soo said. "The best bone graft is still your own bone, but that is in limited supply and sometimes not of good quality. What we show here is a faster and better way to create bone that could have clinical applications." The study appears June 11, 2012 in the early online edition of the peer-reviewed journal Stem Cells Translational Medicine, a new journal that seeks to bridge stem cell research and clinical trials. In the animal model, Soo and Péault's team put the hPSCs with NELL-1 in a muscle pouch, a place where bone is not normally grown. They then used X-rays to determine that the cells did indeed become bone. "The purified human hPSCs formed significantly more bone in comparison to the SVF by all parameters," Soo said. "And these cells are plentiful enough that patients with not much excess body fat can donate their own fat tissue." Soo said if everything goes well, patients may one day have rapid access to high quality bone graft material by which doctors get their fat tissue, purify that into hPSCs and replace their own stem cells with NELL-1 back into the area where bone is required. The hPSC with NELL-1 could grow into bone inside the patient, eliminating the need for painful bone graft harvestings. The goal is for the process to isolate the hPSCs and add the NELL-1 with a matrix or scaffold to aid cell adhesion to take less than an hour, Soo said. "Further studies will extend our findings and apply the robust osteogenic potential of hPSCs to the healing of bone defects." Scientists have successfully sequenced the genome of a baby in the womb without tapping its protective fluid sac. This non-invasive approach to obtaining the foetal genome is reported in the June 6 issue of Science Translational Medicine, a journal of the American Association for the Advancement of Science. sequence the whole foetal genome. Maternal blood sampled at about 18 weeks into the pregnancy and a paternal saliva specimen contained enough information for the scientists to map the foetus' DNA. This method was later repeated for another expectant couple closer to the start of their pregnancy. The researchers checked the accuracy of their genetic predictions using umbilical cord blood collected at birth. Jacob Kitzman and Matthew Snyder, working in the laboratory of Dr. Jay Shendure, associate professor of genome sciences at the University of Washington, led the study. Kitzman is a National Science Foundation Graduate Research Fellow. Scientists have long known that a pregnant woman's blood plasma contains cell-free DNA from her developing foetus. Foetal DNA appears in the mother's plasma a few weeks after conception. It rises during gestation and normally vanishes after the baby arrives. While the concentration varies among individuals, about 10 percent of the cell-free DNA in a pregnant woman's blood plasma comes from her foetus. Based on this phenomenon, other research labs are designing maternal blood tests for major aberrations in the foetus's genetic makeup. The tests are considered a safer substitute for the more invasive sampling of fluid from the uterus, a common procedure in obstetrical practice. These new tests search for just a few genetic disorders or specific congenital abnormalities. For example, a test targeted for Down syndrome would look for evidence of three copies of chromosome 21. Kitzman explained what distinguishes his team's latest methods is the ability to assess many and more subtle variations in the foetus' genome, down to a minute, one-letter change in the DNA code. "The improved resolution is like going from being able to see that two books are stuck together to being able to notice one word misspelled on a page," said Kitzman. With technical advances as well as statistical modelling, the research group overcame several obstacles that had stymied previous efforts to determine foetal genomes. With a preponderance of maternal rather than foetal DNA in plasma samples, a major problem was figuring out which genetic variants had passed from mother to child. The scientists applied a recently developed technique to resolve the mother's haplotypes, which are groups of genetic variations residing on the same chromosome. From these groupings, the researchers could pick out the parts of the baby's genetic material inherited from each parent with over 98 percent accuracy. "It was rewarding to apply biostatistics to help solve this problem," said Snyder, who came to genome sciences from the fields of statistics and economics. Still, he added, there is more work to be done to improve this technique. The researchers pointed to the need for a more robust, scalable, overarching protocol, as well as ways to lower costs and automate and standardize parts of the process. A child can have genetic variations not shared with either parent. These brand new or de novo mutations can occur during egg or sperm formation or at or near conception. Because de novo mutations underpin a substantial proportion of dominant genetic disorders, searching for them is critical to comprehensive prenatal genetic diagnosis. The researchers showed that ultra-deep sequencing, computational biology and statistics could locate de novo mutations genome-wide in the growing foetus. They discovered 39 of the baby's 44 de novo mutations while it was a foetus. The results suggest that a more refined, less costly version of their approach might make prenatal genetic screening vastly more comprehensive. Although technical and analytical difficulties currently exist, the researchers anticipate removal of these hindrances. "This work opens up the possibility that we will be able to scan the whole genome of the foetus for more than 3,000 single-gene disorders through a single, non-invasive test," said Shendure. Although each specific disorder is rare, in aggregate single-gene diseases, also called Mendelian disorders because of their mode of inheritance, affect about one percent of new-borns. The serious nature of these diseases often calls for specialized medical attention. Shendure mentioned recent advances in detection of de novo mutations which have underscored the important role they play in disorders with more complex origins. These include, but are not limited to, some cases of autism, epilepsy, schizophrenia, or intellectual impairments. However, using genome sequencing to predict and communicate risk to patients would be hard in a clinical setting, due to limited knowledge about multi-gene diseases and their many contributing factors beyond genetics. "The capacity of genomics to generate data is outstripping our ability to interpret it in ways that are useful to physicians and patients," said Shendure, who is an M.D. and Ph.D. medical scientist. "Although the non-invasive prediction of a foetal genome is now technically feasible, its interpretation – even for single-gene Mendelian disorders -- will remain an enormous challenge." A pregnant woman's blood stream contains not only her own cells, but a small number of her child's, as well, and some of them remain in her internal organs long after the baby is born. Understanding the origin and identity of these cells is vital to understanding their potential effects on a mother's long-term health. For example, foetal cells have been found at tumour sites in mothers, but it is unknown whether the cells are helping to destroy the tumour or to speed its growth. Three types of foetal cells have now been identified in the lungs of late-term pregnant mice by a team led by Dr. Diana Bianchi of Tufts Medical Center. 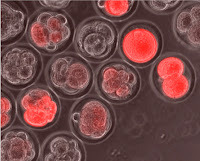 The research, published 6 June 2012 in Biology of Reproduction's Papers-in-Press, used publicly available databases to extract important genetic information from as few as 80 foetal cells. A combination of two different analytical techniques to characterize the rare foetal cells revealed a mixed population of trophoblasts (placental cells that provide nutrients to the foetus), mesenchymal stem cells (cells that later develop into fat, cartilage, or bone cells), and immune system cells. Researchers suspect that foetal cells in a mother's blood stream help her immune system tolerate and not attack the foetus. The detection of trophoblasts and immune cells in the maternal lung should aid future studies on this subject, as well as research into pregnancy-related complications like preeclampsia. The presence of foetal mesenchymal stem cells corresponds with previous studies that reported foetal and placental cells differentiating to repair injured maternal organs in both mice and humans. Using this team's techniques of gene expression analysis, researchers should now be better able to identify the types of cells present in maternal organs and in doing so determine their potential short- and long-term effects on a mother's internal systems. Pritchard S, Wick HC, Slonim DK, Johnson KL, Bianchi DW. Scientists at the Gladstone Institutes have for the first time transformed skin cells — with a single genetic factor — into cells that develop on their own into an interconnected, functional network of brain cells. The research offers new hope in the fight against many neurological conditions because scientists expect that such a transformation — or reprogramming — of cells may lead to better models for testing drugs for devastating neurodegenerative conditions such as Alzheimer's disease. This research comes at a time of renewed focus on Alzheimer's disease, which currently afflicts 5.4 million people in the United States alone — a figure expected to nearly triple by 2050. Yet there are no approved medications to prevent or reverse the progression of this debilitating disease. In findings appearing online today in Cell Stem Cell, researchers in the laboratory of Gladstone Investigator Yadong Huang, MD, PhD, describe how they transferred a single gene called Sox2 into both mouse and human skin cells. Within days the skin cells transformed into early-stage brain stem cells, also called induced neural stem cells (iNSCs). These iNSCs began to self-renew, soon maturing into neurons capable of transmitting electrical signals. Within a month, the neurons had developed into neural networks. "Many drug candidates — especially those developed for neurodegenerative diseases — fail in clinical trials because current models don't accurately predict the drug's effects on the human brain," said Dr. Huang, who is also an associate professor of neurology at the University of California, San Francisco (UCSF), with which Gladstone is affiliated. "Human neurons — derived from reengineered skin cells — could help assess the efficacy and safety of these drugs, thereby reducing risks and resources associated with human trials." Dr. Huang's findings build on the work of other Gladstone scientists, starting with Gladstone Investigator, Shinya Yamanaka, MD, PhD. In 2007, Dr. Yamanaka used four genetic factors to turn adult human skin cells into cells that act like embryonic stem cells—called induced pluripotent stem cells. Also known as iPS cells, these cells can become virtually any cell type in the human body — just like embryonic stem cells. Then last year, Gladstone Senior Investigator Sheng Ding, PhD, announced that he had used a combination of small molecules and genetic factors to transform skin cells directly into neural stem cells. Today, Dr. Huang takes a new tack by using one genetic factor — Sox2 — to directly reprogram one cell type into another without reverting to the pluripotent state. Avoiding the pluripotent state as Drs. Ding and Huang have done is one approach to avoiding the potential danger that "rogue" iPS cells might develop into a tumor if used to replace or repair damaged organs or tissue. "We wanted to see whether these newly generated neurons could result in tumor growth after transplanting them into mouse brains," said Karen Ring, UCSF Biomedical Sciences graduate student and the paper's lead author. "Instead we saw the reprogrammed cells integrate into the mouse's brain — and not a single tumor developed." This research has also revealed the precise role of Sox2 as a master regulator that controls the identity of neural stem cells. In the future, Dr. Huang and his team hope to identify similar regulators that guide the development of specific neural progenitors and subtypes of neurons in the brain. "If we can pinpoint which genes control the development of each neuron type, we can generate them in the petri dish from a single sample of human skin cells," said Dr. Huang. "We could then test drugs that affect different neuron types — such as those involved in Parkinson's disease — helping us to put drug development for neurodegenerative diseases on the fast track."